I did a post about visiting the charming town of Smithfield, Va.? Sherry, your mantle is gorgeous. I love the architectural piece your found. It certainly is an amazing piece. Perfect above your fireplace. Wow what a great piece. A once in a lifetime find! 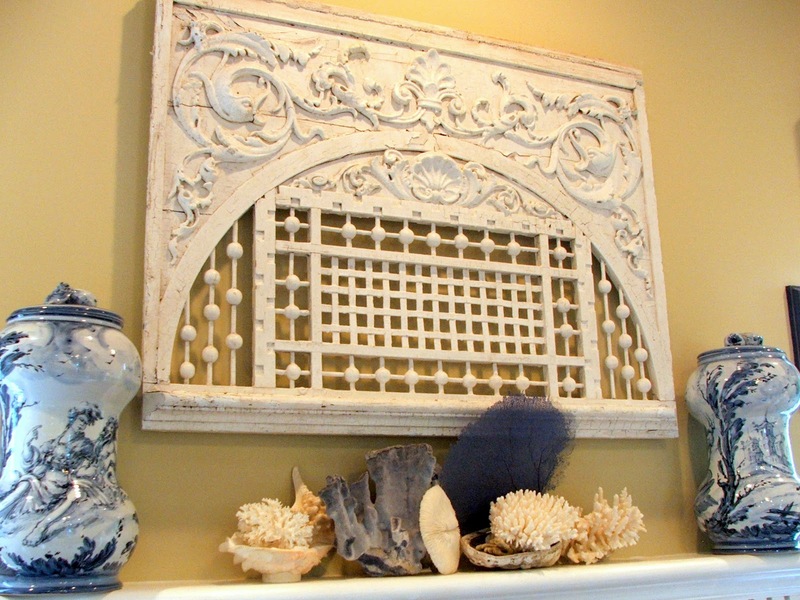 Such a pretty beachy mantel, Sherry! I love your architectural find. Oh my goodness, I love that piece. I agree with everyone else–what a find! It is stunning! If you ever want to sell….call me! Sherry, your mantel looks so pretty! The architectural piece is just gorgeous and looks perfect there, with your coastal accents! Oh, Sherry, it is fabulous! Love your summer mantel. That's such a beautiful piece, Sherry! Your Summer mantel is very pretty. Oh Sherry I LOVE that piece!! Your mantel looks beautiful!! I really like the simplicity of your mantle. The architectural piece is fantastic! 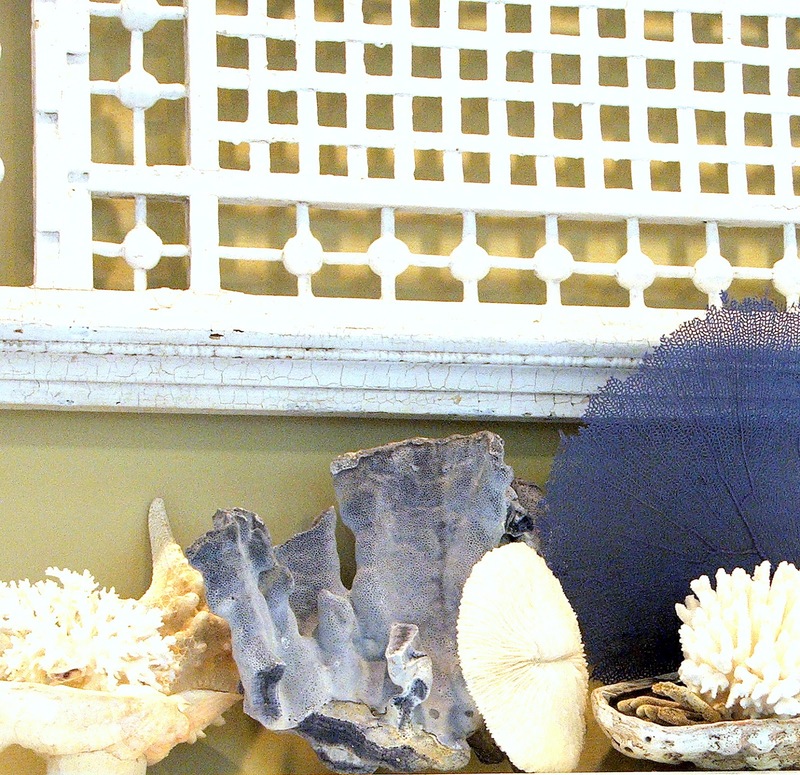 Your mantel is perfect for summer! I love the mix of shells and sea fans you arranged. Oh my, it is so lovely, and I love how you are using. Brilliant!! What a fabulous piece! The coral is beautiful too. Love your architectural piece Sherry, but how fiddly to clean! Ohhhh … pretty! I love, love, love it!!! I love this beautiful piece and it's perfect over the mantle. Could it be that it is an antique heater grate. Very pretty. OMG – that piece is beyond gorgeous and it looks fab above the mantle!! Gorgeous! I love your new find. Your mantle speaks summer beautifully. Enjoy your weekend. What a beautiful piece! I love the way it looks on your mantel. I was just thinking about changing my mantel again. I have a beach theme right now which is fine for summer but I feel like I need to change something….I should just wait till fall though! Have a great weekend! Oh what a find. 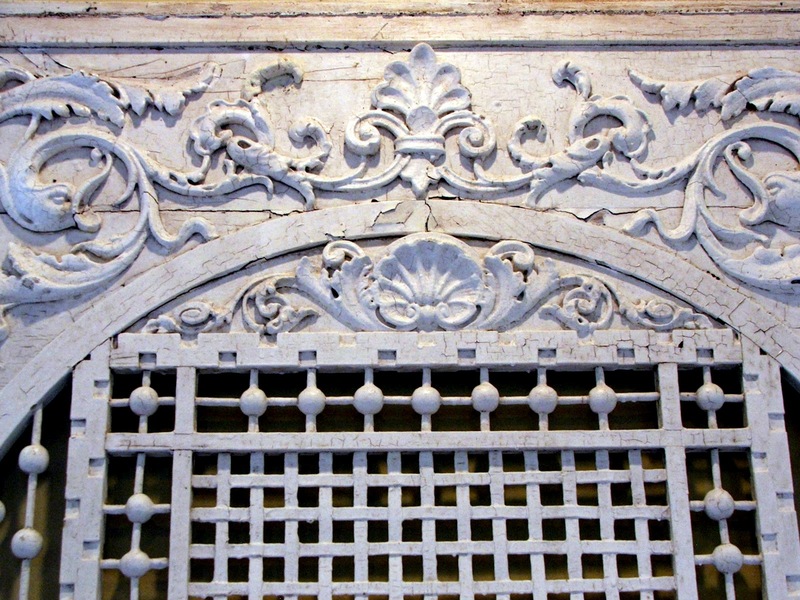 I love architectural fragments and this one is fabulous. It's perfect on the mantel. 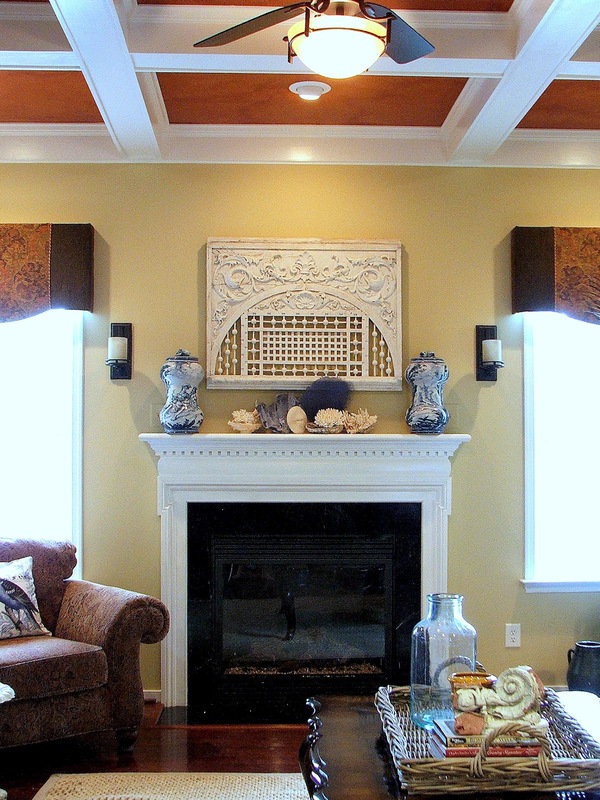 What a beautiful mantel, Sherry…and the architectural piece is stunning! I had to pin it, of course! You summer mantel is gorgeous! Sherry I see why it was love at first sight! That piece wants to get noticed! And no wonder… it is stunning! Great addition to your mantle! It is one-of-a-kind! So gorgeous~ what a beautiful piece!! Thanks for linking up at Feathered Nest Friday! Feels like the beach! Great way to celebrate Summer indoors! Sherry, that architectural piece is FABULOUS!! What beautiful piece to put over the mantel! Thank you for joining me at Home Sweet Home! I am in love with that piece…I so love architectural elements mixed in with art…so much more interesting to me…great textures on your mantel…Beautiful!